Description: B.B.C.1982, first edition : card cover approximately 18 x 21.5 cm tall: 144 pages including index: monotone diagrams throughout. Synopsis: Comprehensive instruction on renovating furniture with instructive text supported by labelled diagrams. Subjects covered include: – Finishes and Polishes. Surface Repairs. The Structural Repair of Chairs, Tables and Cabinets. Simple Upholstery. Hardware. Necessary Tools. Basic Techniques. Finding a Supplier. Condition: slight foxing to preliminary page and page edging: overall very clean and good. Mary Ward Books is an independent online bookstore specialising in second hand, out of print books and used books such as Better Than New a practical guide to renovating furniture by Albert Jackson and David Day. We offer a book search facility and secure payments via PayPal and Nochex. Mary Ward Books is based in East Anglia, United Kingdom. We were established in 1997 and have been selling books online since 2002. 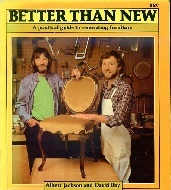 We ship worldwide, please click here to see our shipping charges for Better Than New a practical guide to renovating furniture by Albert Jackson and David Day.